Take a photo that says “I was here!”. 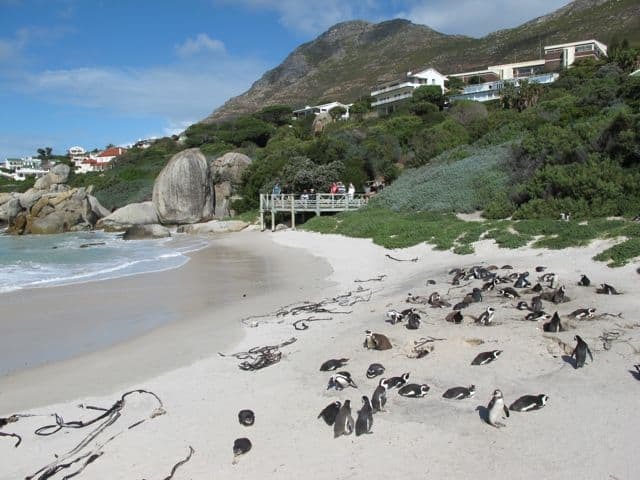 The African penguin colony at Boulders Beach – the penguin survived the kidnap attempt! 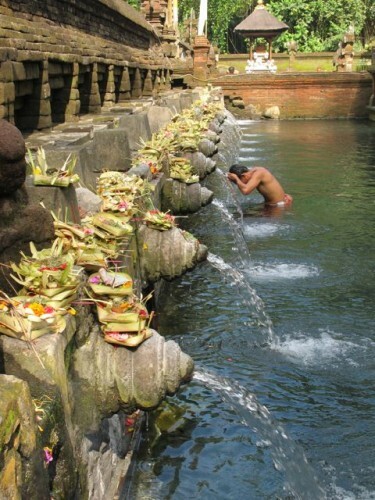 Bathing ritual at the Sacred Water temple in Bali. Ask locals for their permission before snapping away. I have to be honest though. I haven’t always been a responsible tourist myself – I’ll never forget that moment when I was chased out of a market by two Mayans in Chiapas, Mexico, for taking photos of them. That’s one lesson (also highlighted below) I learned very quickly! That said, I do my utmost to be conscious of my surroundings and of local customs. If I’m not sure, I see what the locals do first, or I’ll ask them. To me its important to be aware and respectful, and to show empathy. I may not agree with some customs or traditions and I may occasionally voice my disagreement but always in a respectful manner. In addition, I always stick to the paths or trails along historic monuments or national parks, and I always resist the urge to touch a monument, like statues, or bring a free souvenir home with me in the form of a seashell or pebble. Simply abiding by these principles has allowed me to enjoy travel so much more and pick up many valuable lessons and insights along the way, which, to me, is what travel is all about. “The key to being a responsible tourist comes down to empathy and the simple saying “do onto others as you’d have them do onto you”. Regardless of what part of the world you’re in, remember we’re all connected and wanting the same things in life which is health, happiness and respect. If you follow these simple guidelines you’re sure to have a meaningful experience and will most likely connect on a deeper level with the destination you’re visiting and the people who call it home.” – Rob Lloyd from Stop Having a Boring Life. “If someone is not aware of local or general etiquette in travel, it’s always a good idea to do some research before going on a trip. Google it or any local will help! But mostly, everyone should be okay with simply being a nice person, respecting foreign cultures and people on their way.” – Angelika Schwaff from Reisefreunde. A smile can often make such a big difference. “Get off the beaten path. Get out of the tourist zone. Visit and possibly stay in neighbourhoods where you can find mainly locals. You will have a much more authentic experience. Plus, it will be far cheaper. Walk everywhere. Use public transport or hire a bike for the day. Treat people the way you like to be treated – you’d be surprised how some tourists can be total jerks and lose their manners when they travel abroad. Respect local customs. Be patient. Plus remember to smile. A smile can often make such a big difference.” – Kash Bhattacharya from Budget Traveller. 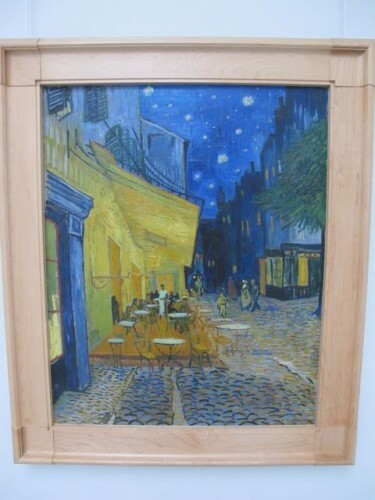 “Terrace of a café at night (Place du Forum)” by Van Gogh. In front of a masterpiece, use only your eyes. “Remember that you are a guest at someone else’s home – be that a country or a hotel or anything – what would you do if you went to visit your best friend’s parents house? In this scenario, people would be at their best behaviour and it saddens me when it is not the case. Be nice, be patient, don’t disturb others. Be open minded – things may not happen at the pace that you are used to at home – and that is OK, because that is why you travelled to place X in the first place.” – Ana Silva O’Reilly from Mrs O Around the World. “Ask for permission before clicking photos of locals. I experienced that first hand in a small village in the Indian Himalayas, while talking to an old mountain lady. A man walked right up to us, and without even a smile on his face, blinded us with a flash and walked away. The lady lamented how that is nothing new, that most people visit to photograph them but leave without knowing anything about their lives. Some of these nameless pictures will be exhibited and sold. That is the day I decided that as much as the native people of a place make for good subjects for travel photography, before I click any faces with my camera, I will have both their permission and their story. Imagine how you would feel if someone shoved a camera in your face without so much as exchanging a word with you.” – Shivya Nath from The Shooting Star. Shivya also wrote: “5 Ways I’ve Changed to Travel More Responsibly“. Ladies working in their vegetable garden in Mauritius – they happily obliged us when we asked to take a photo. One more tip from me: if you’re sensitive to noise when you sleep, ear-plugs can help, or even better, noise-cancelling headphones! Travel near or far. Travel safe. And above all, travel responsibly! Travel is all about having a new experience away from your daily activities. It’s about getting out from the adopted environment to a new environment. You can see the new place and have a great memories of the place regarding local food, Local people, Culture and many more. But people forgot they are responsible for making the environment neat and clean. I have a travel team and we collect the dust and the plastic bags from hilly region of Nepal to make next batch of traveller to be humble with nature. Oh that first paragraph gave me a migraine. 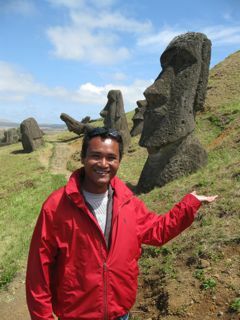 Who thinks it’s okay to vandalize the Easter Islands?! And seriously, warm beer is the biggest problem in your life? When I book travel for clients I always give them information on the local customs if they are traveling overseas. I wrote this post as a bit of a rant but also to offer some views on how we can travel more responsibly. My hope, in this age of globalisation, is that people will be more aware of their responsibilities to others as well as to nature whenever and wherever they travel. Most of it is just common sense but people have to be made aware of the consequences of their actions… and I hope this post contributes to that. Hear hear! This really resonated with me. Thanks for bringing it up Keith. The penguin story reminded me of my own experience at Phillip Island in Australia. Visitors are explicitly told not to take photos because the flashes and clicks can disorientate, confuse and otherwise disturb the creatures yet so many people think they can get away with using camera phones etc. It’s literally a case of people doing exactly what they’re told not to do. I was devastated by the lack of common sense and humanity, and just couldn’t fathom what they feel like they can gain from what is probably going to be a really bad photo of a penguin! A traumatised penguin at that. I am a Chinese myself but I wish more China tourists and travelers would read your post before they travel. No kidding man! Seriously! That baffles me as well! I agree, the best we can do is set an example and create awareness for best practices. Thanks for your comment Edward! How on Earth did that tourist think they were going to get the penguin home undetected? There are some really stupid people out there, but the best we can do is set an example ourselves … great post! Thanks Fiona! That really annoys me no end as well and spoils the experience for everyone else. Such a shame. I’m not kidding myself; there will always be idiots out there but I hope that by raising awareness of every tourist’s responsibility, that there will be more who’ll be more conscious when they travel. Love this. I’ve been preaching this a lot lately in my travels. I remember when I was living in the UK, and I heard that they were putting up barriers around Stonehenge because tourists were chipping off pieces and writing on the stones. I was shocked and outraged! Unfortunately I’m not sure what advice can be given to such stupid, inconsiderate tourists… They really do ruin it for the responsible, respectful travelers. Exactly, right? Would anyone wear a bikini to church?!?! Simple common sense really. Your post is on a topic that anyone who leaves their front door, should read! It’s so important to be respectful and sensitive to local issues. I remember reading about some British girls who were arrested after visiting a temple in Chiang Mai wearing skimpy bikinis! I was really upset when I heard ‘cos I mean come on! Would anyone wear a bikini to church? Noooo! So why a holy temple in a foreign country! And as for taking photographs. Local people aren’t animals. They have feelings too. Just smile, and ask. Most importantly, smile! Thank you Brittany for your lovely comment. It’s a topic I care very much about and hope this post will help to create more awareness amongst tourists and be more conscious and respectful when they travel. This is a fantastic article! I try my best to be aware of my actions and respect the local culture when I travel somewhere new. I enjoy learning about the culture, traditions and customs of a place before I arrive so that I can better understand the destination. I am glad that responsible travel is a growing movement!